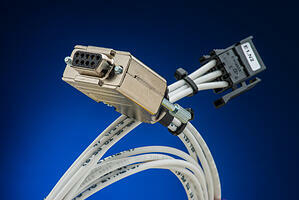 A recent article in Assembly magazine discusses several case studies in wire harnessing. 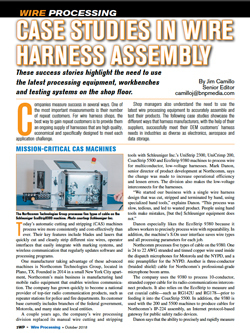 Author Jim Camillo speaks of the importance for wire harness assemblers to use the latest processing equipment, workbenches, and testing system. He also highlights, when sharing Fourstar’s time-to-market success story, the vital role collaboration played in our project with Coghlin Companies (its prototype, DCI Engineering, and electronics manufacturing services, Columbia Tech, reached out to Fourstar in 2013). The original proposal asked for support building prototypes that required 100 assembly configurations to be outfitted for a cloud computing mobile data center solution. By the end of the project, Fourstar produced over 500 individual configurations of cable and electro-mechanical assemblies for the project—consisting of 13,200 cable harnesses—contributing to the manufacturing and deployment of 39 mobile data centers to support cloud computing infrastructure. According to Jim Coghlin, Columbia Tech’s Chief Operating Officer, this was the “largest technology order of its kind placed—ever.” As such, Fourstar sought manufacturing support form Tornik LCC, further helping us to meet our production commitments to stay on schedule and within budget. A project with this scope and timeline pressure would not have been possible without dedicated collaboration throughout the supply chain and within all the stages of development, production, and delivery. Flexibility and the ability to make decisions and changes in a very tight timeline were the two top criteria necessary to navigate through the layered reach of this project. in mid-August and finished in mid-October. Click here if you’d like to read the PDF of Camillo’s Assembly article. We’re happy to report that there has not been a single quality issue since deployment of these mobile data centers, and Columbia Tech’s client has offered very positive feedback. As such, Columbia Tech was a top-10 nominee for its client’s President’s Quality Award. Fourstar has been delivering the highest quality cable assemblies, wire harnesses, electronic assemblies, and full-turnkey complex box builds to our industry-leading customers for 30 years. As an electronic manufacturing services provider, we assess your needs and objectives and recommend the most effective manufacturing solution with emphasis on optimizing your total cost, quality, and lead time. Fourstar excels at helping high-tech companies finish the last leg of the dash to new product introduction and production delivery. We have the program management and manufacturing capability to support a fast-turn production build (large or small) or preproduction prototype run. Fourstar partners with leading companies to “find a better way” for new product introduction (NPI), design for manufacturing (DFM), and time to market initiatives. How can we find a better way for you? We helped Columbia Tech get to market with a massive project and discuss it in more detail in this case study. We think you’ll find it an interesting read.